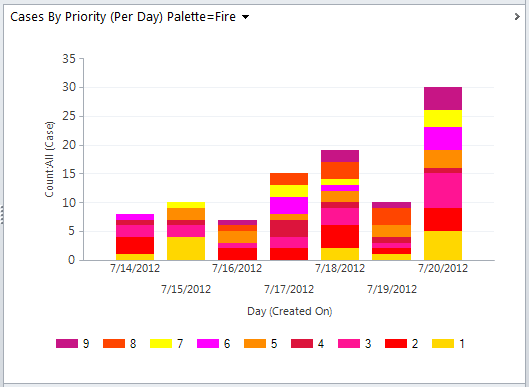 When creating charts in Dynamics CRM/365, CRM creates a custom palette. However, it is the same custom palette that is being used throughout all your charts. 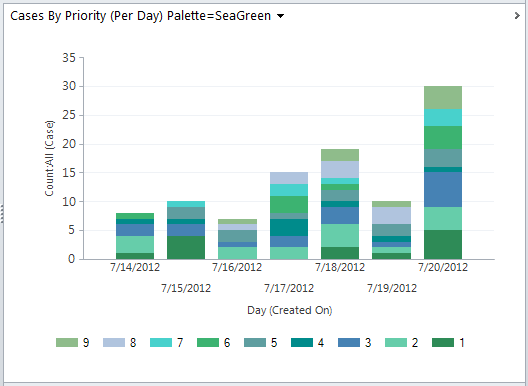 So when you have dashboards with charts displaying data from different entities or different types of data, it can be difficult for the user to tell the information apart when everything is red, green and blue. Fortunately, it is fairly easy to export the charts XML file and modify it to display different color schemes, or Palettes as they are called. The Palette settings can be found right in the beginning of the presentationdescription. A quick search for “Palette” in your favorite xml editor (mine is Notepad++) will help you find it. Unfortunately, Microsoft doesn’t seem to provide a graphical overview of the colors included, so here are some samples to give you an idea of the color schemes. The series is numbered 1-9 and are sorted in the same order. Meaning series 1 is the first color awarded etc. 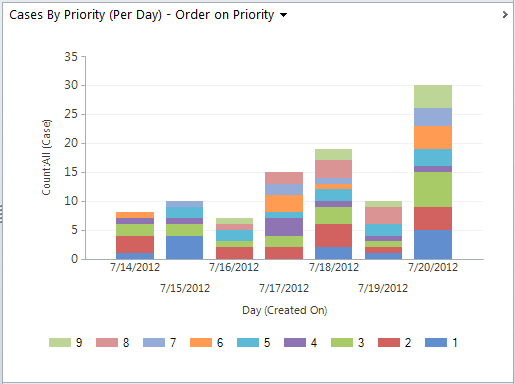 I am using a stacked column chart which shows the series in reverse order. Not sure why that is the default setting for a stacked chart. I figured 9 colors was enough to get an idea of what the palette looks like. You are probably familiar with this color scheme by now. Interesting that this is the only Palette that features a scale that gradually increases from light to dark. This might have been useful with other colors too. But WHY!!!!! 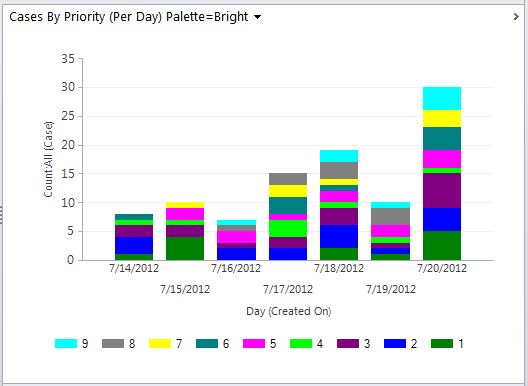 – Well, if you really like the Excel color scheme. If you look closely you can see the gridlines through the columns. This may be more interesting to use on area charts or radar charts. 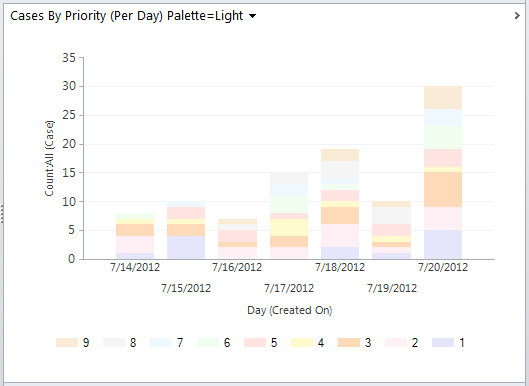 I need your help regarding some properties on Chart Series ! This works fine as per I want. I want to set a customPalette on Series. How can I do that ? I know I can do that by setting Palette=”none”. But how can I define color scheme for paletter Custom colors ? 2. If I try for msdn, all the documentation seems to be relative to SSRS rdl files. 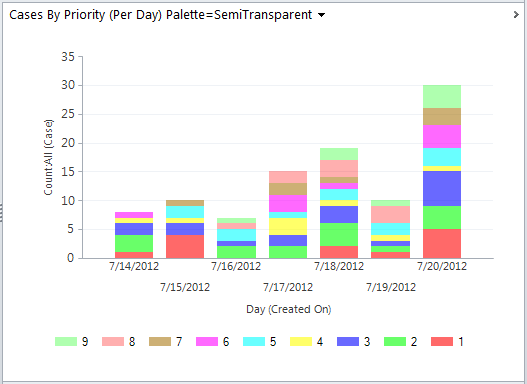 And I noticed that CRM chart visualisation properties are different than SSRS design properties. Where can I find proper documentation on this ? WordPress unfortunately has a tendency to suppress code in comments. This is fab- we can set palettes for individual charts; thank you. 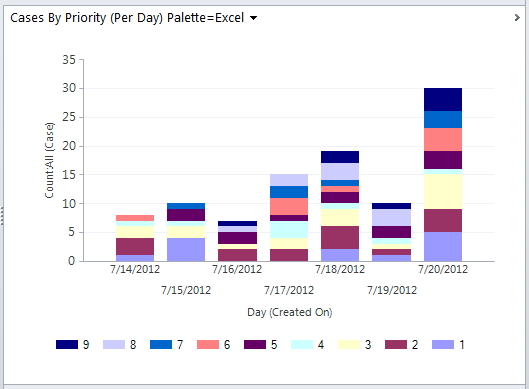 Is it possible to change the default for all charts at a system level (dynamics crm) rather than individual chart level? We look forward to your advice.